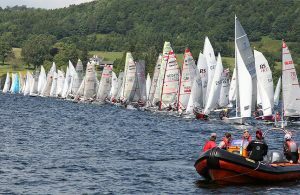 The Lord Birkett Memorial Trophy, now in its 56th year, returns to Ullswater Yacht Club on 6 & 7 July 2017. First a 1963 celebration regatta in honour of Lord Norman Birkett, who passed away two days after successfully preventing Ullswater from becoming a reservoir in the House of Lords, the club has held the round-the-island race each year since. The Birkett is now the biggest event of the year – a festival of sailing attracting racers of all levels from all over the country.